1/4 cup + 2 tsp. Wash hands. Preheat oven to 375˚F. Prepare the topping: In a medium bowl, whisk together sugars, cinnamon, salt, and flour. Add melted butter and combine until the mixture creates crumbs. Set aside. Prepare casserole: In a medium mixing bowl, whisk together flour, sugar, baking powder, cinnamon, baking soda and salt. In another bowl, mix together milk, vanilla, oil and egg. Whisk until smooth. Add the wet ingredients to the dry ingredients and mix together. Pour the cake batter into a prepared 9×13 baking dish. 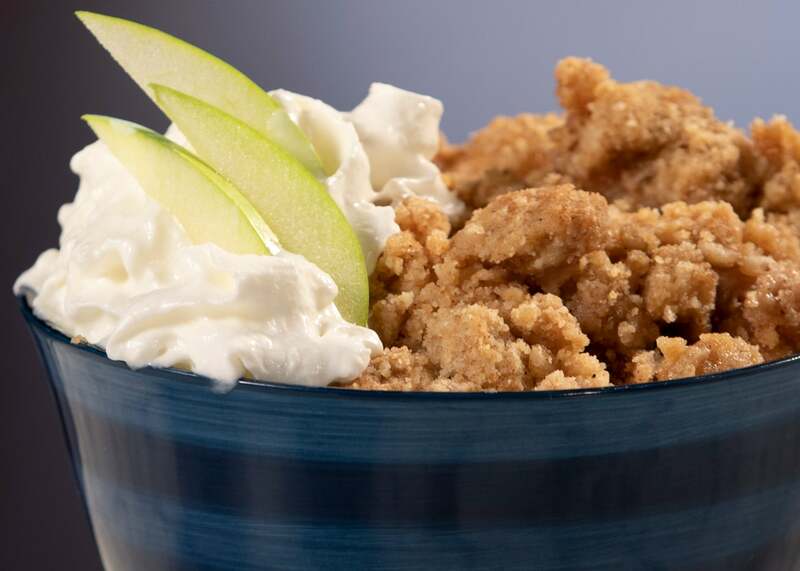 In a medium bowl, toss together apple slices with two tablespoons of sugar and 1/2 teaspoon of cinnamon. Set aside. Place apple slices over the cake mixture. Sprinkle crumb topping over the apples covering completely. Bake the casserole for 30 to 35 minutes or until the topping is golden brown. Let cool completely in the pan. Serve with whipped cream (optional).